Little kids love to have stories read to them. I know my 3 year old can’t get enough of it! In the last couple of years a few story reading devices have come onto the market. These gadgets will read the words to your child as he/she follows along in the book. These devices can be great for those times when your little one wants a story right now, but you can’t immediately drop what you are doing. They can also work well for helping budding readers get through the tough spots. Unfortunately, nothing quite beats the comfort of having a story read by a loved one. The In Your Own Voice Storyteller combines the reading gadget technology with the sound of your own voice. The really cool thing about this product is that it comes with a set of 600 sound stickers. The parent (or other loved one) encodes the stickers with his/her voice information and places them on the pages of the book. The set also comes with 40 sound effect stickers to enhance the stories. 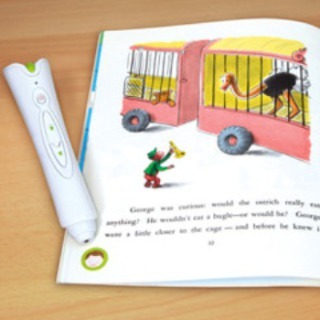 The voice recorder pen is used by the child to play back the words and sounds. We all know that nothing can top actually being there to read to your child, but for those times when you just can’t, this could be a great product. It would allow for parents who have to travel to ‘read’ a bedtime story to their child at night. It would also give grandparents who live far away the opportunity to be a part of the storytelling experience. You can buy the Storyteller here. Breakthrough Website Taaz.com Offers Makeovers on the Internet!